AutoRunWizard.com - AutoRun Wizard FAQ - How do I AutoRun an HTML file? You can autorun any file with AutoRun Wizard. To launch an HTML file all you need to do is select the Auto Launch tab, select the option to "Launch files(s) located on the CD-ROM". Then click on the Configure button to bring up the AutoRun File properties. Next you have to check the box for the "First file to autorun" and click on the [...] button. Next click on the small folder icon after the "File to Autorun" to open the dialog and select the HTML file you wish to autorun. Under the Misc option you should check the option to Force the file to be opened within the default Internet Browser or within Microsoft Internet Explorer. 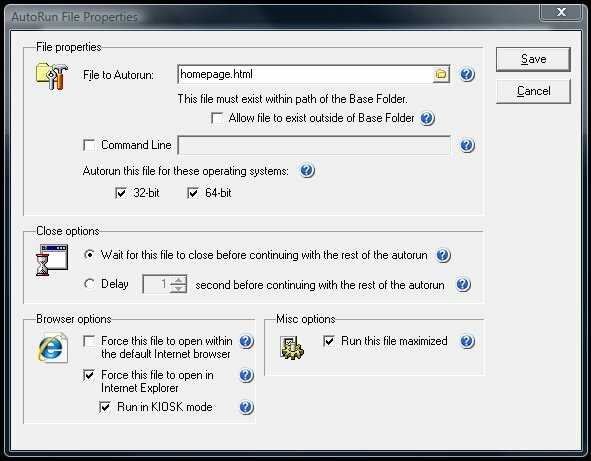 If you choose Internet Explorer you also have the option to run your HTML file in Kiosk mode within the browser. If you do not check one of the options for a browser and the client computer has an extension association to the HTML file, it will open within that application instead of the browser. When the CD-ROM is placed in the drive, it will automatically load the default web browser on the computer loading up your HTML file.